Lonnie Chisenhall #8 of the Cleveland Indians crosses home plate to score a run on a single by Yan Gomes #7 of the Cleveland Indians during the seventh inning of a game at Safeco Field on March 29, 2018 in Seattle, Washington. Injuries have limited Chisenhall to just 84 at-bats this season. Cleveland Indians outfielder Lonnie Chisenhall will miss 8-10 weeks of action after a second opinion revealed a 'Grade 3' strain of his left calf. From Indians: Lonnie Chisenhall's second opinion confirmed a grade 3 strain of the left soleus muscle (calf), and he is expected to miss 8-to-10 weeks. 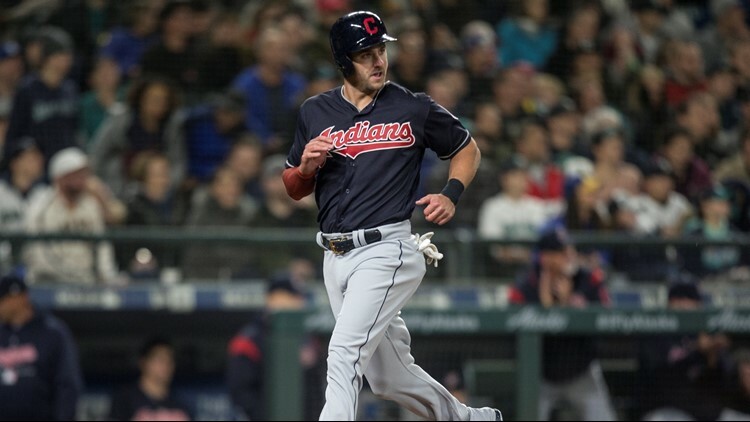 Injuries have been a problem all season for the 29-year-old Chisenhall, who has had just 84 at-bats in 2018. He's hitting .321 with 1 home run and 9 RBI. Chisenhall's injury is compounded by the fact that CF Bradley Zimmer is still out of action with a shoulder injury with no timetable for his return. The Indians have been rumored to be shopping for outfielders prior to the non-waiver trading deadline at the end of this month. They also recently brought back veteran OF Melky Cabrera to Class AAA Columbus and have been experimenting with top prospect Francisco Mejia as an outfielder at Columbus.